Happy Friday guys! After not having the time to write new posts the past week, I finally shared two Cape Town posts here on the blog this week. The first one was all about the city itself, and I shared ten reasons why you need to travel to Cape Town. There are many more reasons why a trip to Cape Town definitely is worth it as there is so much you can see and do, but this time I decided to focus on only ten things. The other guide I finally shared was the food guide. We discovered lots of amazing cafés and restaurants during our week in Cape Town, and I shared my favourites with you. 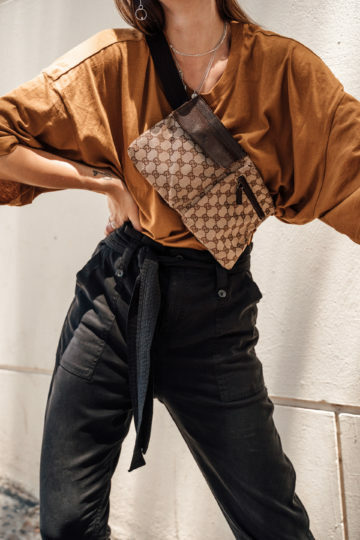 You guys all know the belt bag trend that got very big in 2018. But you might wonder what a fanny bag is. Well, it actually is the exact same. 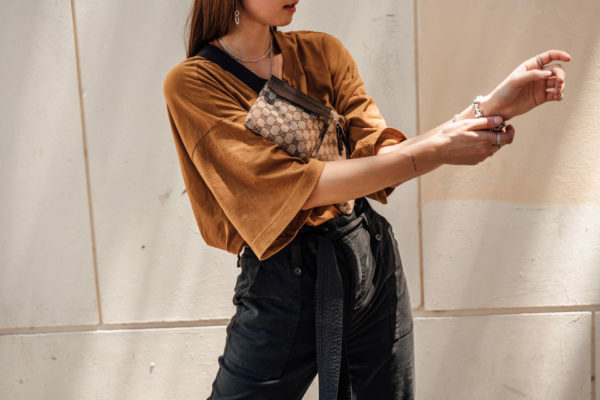 This trend has so many names – belt bag, fanny bag or waist bag – and it actually is up to you how you call it. It is one of the trends you can still see on the streets, but it definitely got a little bit smaller. Nevertheless, I still enjoy wearing fanny bags aka belt bags as they are super handy and easy to carry around. Especially in Cape Town when I had to take lots of photos, it was so handy that I didn’t have to care about where to leave my bag while taking photos. In general, there are many different ways to wear a fanny bag. 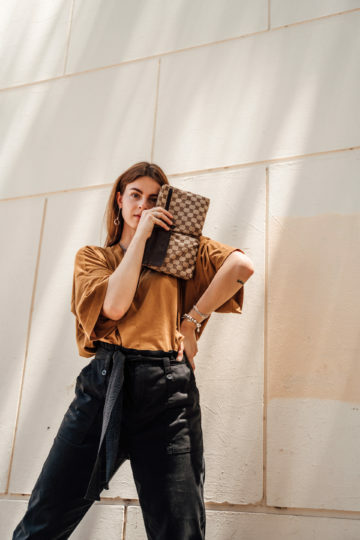 You can either wear it around your waist; you can across one shoulder or your wear it cross-body. I usually wear my fanny bags cross-body or across the shoulder. How do you wear them? That day in Cape Town I was also wearing it cross-body just because it was the most convenient way to wear it as I had to photograph Julia. I combined it with an oversized t-shirt borrowed from Julia and a pair of black pants as well as my black Balenciaga sneakers. I have to admit, it was a little bit warm, but better wearing a too warm outfit than getting another sunburn, right? How do you like this simple outfit? 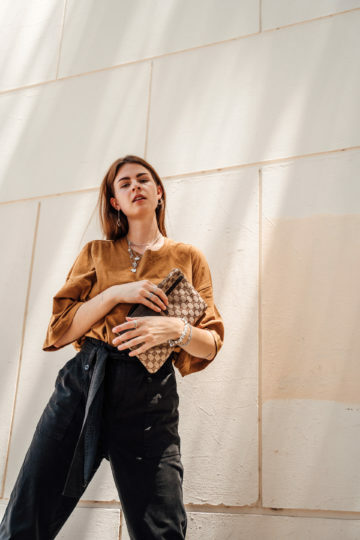 Is it worth it to buy a vintage designer fanny bag? The fanny bag you can see me wearing here is vintage from Gucci. I also got a new model from Gucci, and it definitely is up to you whether you want to spend that much money for a trend piece or not. 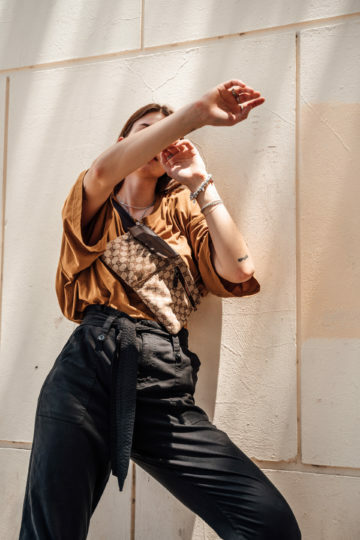 Apart from the fact, that fanny bags and belt bags are just a current trend, you should always ask yourself if you like it for what it is or just because it is a trend piece. When I buy trend pieces, I ask myself if I am going to wear it a lot and even when it’s not in fashion anymore. Never buy a designer piece – no matter if vintage or new – when you can’t see yourself wearing it multiple times. Even when you are wearing it for a year only but you wore it almost every day, it definitely wasn’t a bad buy. Once you are sure about it, buying a vintage fanny bag definitely is worth it. 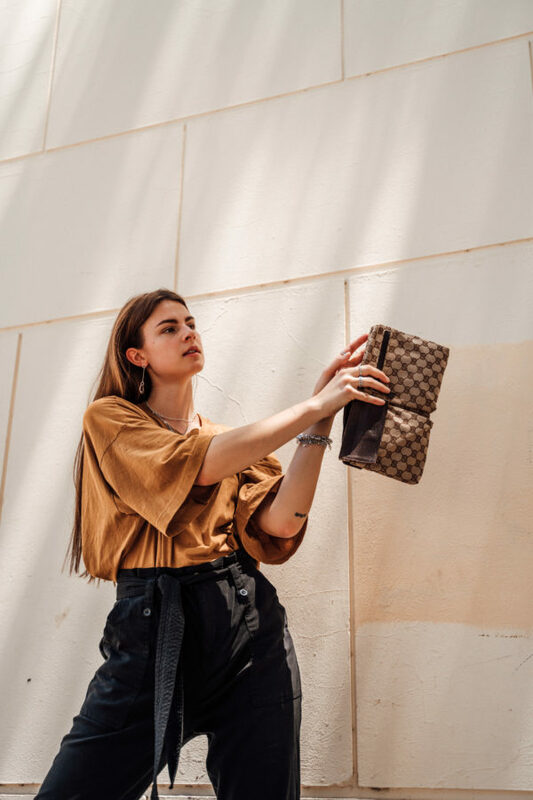 Maybe it’s an even better option than buying a new designer fanny bag as the price might be a little bit lower.